Also known as Hell Girl or the Girl From Hell, this sinister anime series is a collection of short stories depicting the suffering of individuals who post grudges on a website accessible only at midnight, only to have their grievances avenged by an evil force. 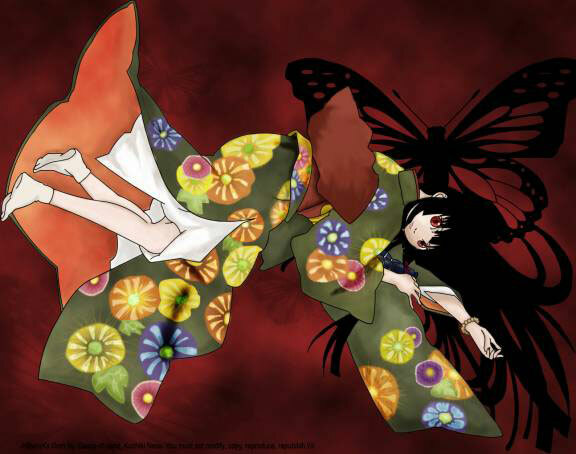 If someone were to submit the names of the tormentor on the website, Enma Ai, the Jigoku Shoujo (Hell Girl) will offer them a black straw doll with a red string wound around its neck. If the string is pulled, she will ferry the recipient of the revenge straightaway to Hell, but on the condition that those who request her intervention rot in Hell as well at the end of their natural lives. Never knowing what paradise is like.. The primary protagonist of the series, who is arguably an anti-heroine as well. With long, straight black hair and ruby-red eyes and pale skin, she is a spiritual entity with a tragic past, who lives in a place frozen in time as it basks in eternal sunset, along with her grandmother. Through an old computer inside their house, Ai is able to receive the names the clients have typed on the website, and she delivers this revenge. She normally wears a black seifuku, or sailor uniform (which is usually worn during winter months), but always wears a kimono with floral (or egg) designs when delivering the vengeance of a client. Ai started her career as the Hell Girl by her own act of vengeance on the villagers who sentenced her to a sacrificial death as part of their village's tradition. Her eyes, once a deep brown, turned red arguably at the point where Sentarou (her childhood soul mate and cousin who gave in under the villagers' pressure to bury her alive) gave the first shovel of soil onto her face. She broke out of her grave after a while, and took revenge on the entire village with her wrath, burning it to the ground, out of anger. Her task of fulfilling other people's vengeance and ferrying people to Hell is her punishment, a task which she had performed for 400 years after that incident. The Lord of Hell who gave her new life to exact others' grievances, made a pact with her; in exchange for her immortal form, she cannot enter hell and must remain on the shores of Hell, acting as the deliverer of people's hatred and vengeance. In order to serve these tasks, the Lord of Hell demanded that Ai forget her own hatred, numbing herself to the sufferings of others and becoming a mere observer of any happenings. If she hadn't this punishment, the souls of her beloved ones would have forever wander in hell, lost for eternity. Having no other choice, Ai agreed with the Lord of Hell and became the Hell Girl. Although this task is presented as atonement, it is unknown whether she will ever be freed of it. Wanyūdō noted she still had feelings, though, although she did not express them strongly, and it was later revealed that Ai had been ordered to close her heart by the Spider. But the experiences she has with the Shibatas reawakened her discontent with her terrible fate and later apparently reawakened other emotions, or at least Ai's ability to express them. When enraged, Ai demonstrates the ability to hurl great blasts of energy, as well as the power to create elaborate illusions and teleport. She also has the ability to show someone the future of a grudge, as she showed Yuzuki in Episode 18 of Mitsuganae. In the second season, Ai becomes more expressive and shows more emotions, being more willing to interact with her "clients" and victims. She even puts up a "V for Victory" sign in front of her target by way of mocking him as he is dragged to his doom. She had also been seen reading from a fashion magazine while her compatriots watch over their client, and had showed concern towards a mother who willingly ended her life so that her daughter doesn't have to send her to Hell. As she witnesses Takuma Kurebayashi's disheartening persecution, Ai recollects her emotions pertaining to her own wrongful persecution and she defies her 'employer', the Lord of Hell, and becomes restored to human life?? and killed shortly thereafter, when saving Takuma from his tormentors. After Ai's self-sacrifice, her body dissolves into sakura petals and drifts into the sky. In the third season, we see Ai's return to the series after. In the beginning of the season, she transports another girl, Yuzuki, to a strange illusion and dream state, where Ai makes the girl her new "vessel". The relationship between Yuzuki and Ai can be compared to the bond that she shared with Tsugumi in the first season, albeit much closer. Her body is later released from hell during The Six-script Lantern ceremony in her town in which the gate to hell is temporarily open allowing Ai to be released from her body. Ai eventually reveals to Yuzuki that she is destined to become her successor. It is ironic that Ai's name actually translates as: Ai (love) and Enma (the Judge of the Underworld). A second translation of Ai, however, is accomplice, denoting Ai's role as Enma's assistant. Another meaning of her name is the kanji for 'sorrow'. Because her first name is never written in kanji, its meaning remains ambiguous. Wanyūdō is the first of Ai's three companions. He generally appears as an old man whose eyes remain mostly shut, wearing a traditional yukata with a long-sleeved haori, and a red scarf around his neck. When needed by Ai, he takes the form of the black straw doll, by wrapping his scarf tight around his neck, that Ai hands to her clients in the series. He also frequently takes the form of Ai's coach with burning wheels when she goes to the human world to claim a soul. The coach bears the same black flame-crest that appears on the chest of those people who contract with the Hell Girl. Despite appearing quite mild-mannered, frail and weak with age at most times, Wanyūdō possesses considerable skills in martial arts and is capable of hurling fireballs and performing feats of inhuman strength. Wanyūdō's name is derived from the yōkai of the same name and means "A wheel entering the road". In episode 12 of Futakomori, it is revealed that he was a princess' entourage carriage, which fell off a cliff. The coach caught fire and all aboard were killed. As a result, he became a yōkai terrorizing people in the form of a flaming wheel with his own enlarged, infuriated face as a hubcap, until he met Ai and she invited him to join her as her first companion. Wanyūdō revealed to Ai his ability to shapeshift. Ren is Ai's second companion, and usually takes the form of a young man. He can manifest a single large green eye that can be directed anywhere, allowing him to see the inside of a building through projecting the eye on the walls and ceilings. The large eye can also be used as a weapon through projecting intense flashes of light. When required, Ren becomes the blue straw doll by kissing a pendant he wears around his neck. Ren's name means "one glance company". He is sometimes referred to as "Moku" or "Ishimoto Ren". His powers in human form is a reference to Daidarabocchi, a type of mythological giant that is enshrouded in shadow. It is later revealed that Ren is a tsukumogami (artifact spirit), a type of spirit that originates from an artifact which has gained sentience after a long period of existence. In Ren's case, he was once a katana, forced to be aware and watch whatever was done with him. He was given his current form(s) by Ai, who collected him after he was abandoned on a large rock after a battle, during which his most recent owner was slain. Ai thinks that he is looking for something and asks him to accompany her. He agrees saying that the rock he was abandoned in was getting pretty boring. Since that time, Ren has apparently grown quite fond of his human form, displaying considerable vanity from time to time. Ai claims she invited him to join her because there is something that Ren is looking for, a fact perhaps manifested in Ren's occasional puzzlement and inability to understand the things humans do. Alternatively, some of Ren's comments indicate that what he was looking for was companionship, something to fill the emptiness of his existence as a sword used for endless killing. Ren has apparently developed feelings for his colleagues, seeing them as family. Hone Onna is Ai's third companion, and she often takes the form of a woman in a kimono with its obi tied in front--the trademark of an oiran (In the second season, her obi is tied at the back) and a slightly disheveled hairstyle. She dislikes being called "old lady". She becomes the red straw doll when necessary by tossing her red obi jime, or cord, over her shoulder. Hone Onna and Ren investigate the people who make a contract and the ones they have a grudge against. She usually infiltrates human society in casual clothing to investigate cases, on these occasions she tends to use the pseudonym "Sone Anna". She has used throwing knives as weapons in the first season of the show, and has shown considerable skill with these weapons. Hone Onna also seems to have some skill as a contortionist, which allows her to squeeze into very small places. The name Hone Onna comes from the legendary creature of the same name, literally meaning "bone woman", which reflects her ability to expose the bones in her body to scare the victims of the revenge Ai delivers. In episode 8 of Futakomori she jokingly refers to her age as being about 200 years old; however, this has never been confirmed. It is revealed that she had been a prostitute named Tsuyi who was betrayed by a man whom she had fallen in love with after he sold her to a brothel to be able to pay off his own debts. Tsuyi was betrayed again when she attempted to arrange the escape of a fellow prostitute named Kion with a man who had come to truly love Tsuyi. Tsuyi and the man were later murdered by a yakuza, and that same yakuza cast Tsuyi into a river afterward. Spirits rising from human bones thrown into the river before merged with Tsuyi's restless spirit, transforming Tsuyi into the yōkai Hone Onna, in which form she later met Ai. She is never actually seen in the series, other than as a shadowy silhouette behind a paper screen that is always spinning thread in her room. She occasionally notifies Ai when a new client beeps on the computer and advises her, occasionally commenting on the cases she takes up. She doesn't talk to anyone except Ai, although in an episode in season one, she made the exception of talking to Shibata Hajime. A single human eyewitness in Futakomori who had observed Ai's grandmother ran in terror, implying that her appearance may be other than human. During the final episode of Futakomori she stops spinning threads for the first time and thanks Ai's three assistants for everything they have done. Ai's Grandmother doesn't appear in the third season until episode 14. That is due to the fact that neither of Ai's companions reside in the realm of Eternal Twilight anymore, and until that episode, instead of the usual ritualistic bathing and the grandma preparing Ai's nangajabun, Ai simply took over Yuzuki's body and appeared already dressed. An oddly-coloured spider with three eyes upon its abdomen, which appears in the sunset world where Ai and her assistants reside between assignments. It speaks with the voice of a man and is apparently Ai's superior, having been the one to pronounce sentence on her after she killed the people of her village. It appears to be holding the souls of Ai's loved ones?? namely her parents?? hostage; if Ai does not do the task she has been given, the spider has threatened that her parents would wander in darkness for eternity. The spider demonstrates an ability to pilot the ferryboat to Hell in Futakomori and tries to restrain Ai, having decided to take her to Hell after her feelings of rage reawakened and she violently attacked the Shibatas. Ai turned out to be too strong for it to hold her without her consent. The spider is neither liked nor trusted by Ai's assistants, with whom it in turn does not speak. In the last episode of Futakomori, Wanyūdō identifies the spider as the Lord of Hell. It can be inferred that the Spider deliberately exposed Ai to a situation reminiscent of her own death in order to test whether she would obey its will or act on her impulse to interfere with Takuma's plight. An enigmatic girl introduced in Futakomori. Little is known about her except the fact she is not human. She can wander freely between the mortal plane and Ai's house in the sunset world, sometimes interfering with her and her companions' job; in one instance, she brought a human into the sunset world out of mischief. In stark contrast to Ai, Kikuri has completely blue/purple eyes (including most of the sclera) and her personality is far more childish (yet much livelier as she has the tendency to pull pranks) than Ai's. She has stated that she likes Ai, and some of her actions and use of powers seem to be causing the greatest amount of suffering and fear possible. It is yet unknown whether this is meant to be truly malicious or not. She seems to take delight in acts of low-level destructiveness, such as chopping off flowers or destroying anything that Ai cares for. She has shown incredible skills with her loincloth, using it to catch or hit objects with considerable accuracy and skill. Despite the fact that she wreaks havoc freely, she has only taken orders from Ai and Ai alone. This is seen when Kikuri touches Ai's grandmother's spinning wheels despite the woman's protests, ceasing only when Ai tells her to. In the last episode of the second season, it is revealed that Kikuri is a host for the will of the Spider, which can take over her body as it pleases. Hence, it becomes questionable how many of her malicious acts were of her own will and which were instigated by her master. Some of her acts could have been to ensure that Ai's clients would pull the string and send their tormentor to hell. Nevertheless, she is still compassionate, showing a brief bout of grief immediately after Ai's death. After Ai's death and the release of her beloved ones to wander as lost souls, Kikuri rides on the boat and says "It's over... that was Ai's answer... Well done". As she says those words, she pokes a cherry the color of Ai's eyes in her former childish way. In the third season, Kikuri possesses a wind-up doll that often needs to be rewound by Yamawaro. 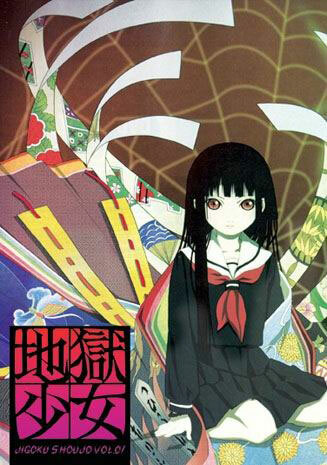 A hell creature commanded by the new Hell Girl in season 3, who takes on the look of a young boy, though he can also become a yellow/green straw doll. In human form, he calls himself by the name of Huang (黄). Often quiet and having a gentle demeanor, not much is known about him as of yet. He follows Kikuri on their assignments in the real world, referring to her as princess. His name is derived from the same name given to a legendary mountain-dwelling creature in Kyūshū from Gazu Hyakki Yakō, an illustrated book on Japanese folklore demons. In episode 6 of Mitsuganae it is hinted that Yamawaro has the power to manipulate objects. In Episode 17 of "Mitsuganae", it is revealed that his name basis holds some truth. He was a ghostly boy who roamed a mountain but whenever he was seen by humans, he looked like a walking pile of mushrooms. 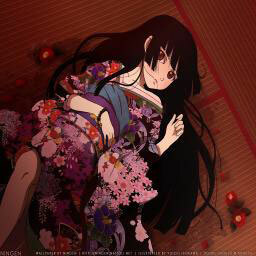 It seems in his time before joining Hell Girl, he looked upon a family by the name of Ashiya. Their son Hikaru had gone missing many years ago. The father of the household was a scientist trying to obtain eternal life. Yamawaro stepped in as their son. Ms. Ashiya accepted him with no worry. Mr. Ashiya, knowing that Yamawaro was obviously not human, opted to use Yamawaro for his "Caterpillar fungus" experiments which still manifests in him till this day. He stated it was "to extend his wife's life". After learning of this, Ms. Ashiya shooed Yamawaro away, hoping to spare him from the parasitic experiments at the cost of her own life. She contacted Hell Correspondence to gain revenge on her husband calling it "Hikaru's vengeance". Despite Yamawaro's begging, she pulled the string. Yamawaro watched as the Ashiya mansion swirled away into a cloud of dust. Ms. Ashiya along with it, clutching what seems to be a young boy. This was a key experience to Yamawaro. A former journalist who now earns money by blackmailing celebrities with evidence of their scandals. He began to investigate rumors about the Hell Correspondence website merely out of interest, but becomes more heavily involved once he realizes that it is more than just a rumor and people are actually being dragged into pit of Hell. Furthermore, his daughter Tsugumi seems to have a mysterious connection with Enma Ai that allows her to see anything significant that Ai sees. Using Tsugumi's foresight ability, Hajime and Tsugumi begin trying to stop Ai's clients from damning one another. He believes revenge to be wrong, and thinks it only causes more pain. Hajime and Tsugumi are shown Ai's past, when they nearly drown in a river. It is also revealed that Sentarou, Ai's only friend, is one of his ancestors. Ai wants revenge against Sentarou, so she takes it out on his blood line and attempts to corrupt Tsugumi in to sending Hajime to Hell. Much to Hajime's relief, Tsugumi refuses. In Futakomori Hajime is shown to be Ai's biographer. A Detective in Futakomori, named Detective Meshiai, attempts to track him down for questioning, but ultimately fails in locating him; revealing Hajime to have disappeared mysteriously between the events of seasons 1 and 2. Tsugumi does not have contact with Hajime in the third season, as she briefly expresses her loneliness. Ai's assistants are unaware of what happened to Hajime, which reveals Hajime was not sent to Hell by Hell Correspondence. What has happened to Hajime remains unknown. In the anime series, his primary mode of transportation is a yellow Mitsubishi Minica, while in the live action series he uses a Yamaha XF50X Vox scooter. Hajime's daughter who often refers to him as Hajime, rather than father or dad. She sees Ai one day and has had a mysterious connection with her ever since. At first, she reports everything she sees through Ai to Hajime, but as the series progresses, she becomes more reluctant to do so as she begins to disagree with her father on whether they should try to stop Ai or not. However, after an innocent nurse is sent to Hell by a drug addict, she begins to realize revenge is wrong. At the end of season one, Ai shows Tsugumi visions of how her father and mother argued just before her mother's death, which lead her mother into leaving the house and dying, in an attempt to corrupt her into blaming Hajime for her mother's death, so she'd send him to Hell. Tsugumi however, refuses. She is briefly shown in the second season as a source of information for an investigator. She tells Detective Meshi to trust her father, then she runs off because she was called by Kikuri. It seems that she has a similar relationship with Kikuri in Futakomori that she had with Ai in the first season. She is apart of the medical staff in Yuzuki's school in the third season; her intentions, however, are not made clear. She is also completely obliviously about the fact that Ai's assistants are also staff members at the school she is a nurse at. During The Six-script Lantern ceremony she advises Yuzuki not to go in the Gates of Hell, and then disappears in the fog mysteriously when Yuzuki looks away. She appears to have uncanny knowledge of the supernatural, having known that Yuzuki wouldn't be able to come back if she entered the Gate of Hell. This knowledge may be due to her spiritual powers of foresight or to her connection with Ai and Kikuri. In episode 20 of Mitsuganae, Tsugumi, along with Ai and Yuzuki, are simultaneously lured into a mansion. Upon entering the mansion, Ai and Tsugumi greet each other, showing that that they have known each other for quite some time. The mansion that they entered is owned by a man named Mizuragi Shogo, who is holding a pact against Tsugumi. Just as Shogo begins pulling the red string off the straw doll, he is sent to Hell by one of his assistants who held a pact against him; thus sparing Tsugumi from being eternally damned. Tsugumi expresses how tired she is of living alone, confirming that she has no longer contact with her father Hajime. Hajime's late wife. Hajime devoted more time to his work than to his family, but with the intent to make his wife happy through earning large amounts of money to improve their lifestyle. In her loneliness, Ayumi had an affair with a politician that Hajime happened to be spying on. Because of that incident, he cast her out of the house and forbade her from ever seeing Tsugumi. A few moments later, Ayumi dies in a car accident. Tsugumi keeps her mother's earrings as a memento. Hajime still loves Ayumi very much, and regrets not forgiving her because he believes she would not have died if he had. On the other hand, Ai tried using her death to tempt Tsugumi to send her own father to Hell. Takuma is a quiet boy who lives in Lovely Hills. He is misunderstood and often bullied by his fellow townsfolk who believe he's the "Devil's Child", much like Ai was in her village. When he first made his appearance, his mother was killed by a friend of his father, who was also seriously injured in the incident. As the murderer was about to kill Takuma, he was sent to Hell; but at this moment the police arrive, and the townsfolk end up thinking that Takuma is the murderer. It is unclear if he possesses as much spiritual powers as Ai, but he does have the ability of foresight and he has been observed by Ai for some time throughout the story. In the end, Ai saves him from the townsfolk, but ends up getting killed herself. At the end of the show it is revealed that his father has recovered almost completely and that his friend, Hotaru Meshiai, will soon wake up from her cold induced coma, as Takuma hopes. First appearing in season 3, Yuzuki is a 9th grader schoolgirl who currently studies at Saigawara 4th Junior High School. Although a normal everyday girl, she actually has deep relations to the Hell Correspondance website. While Yuzuki is in the bathtub one night, Ai appears before her, suddenly kissing the other girl. 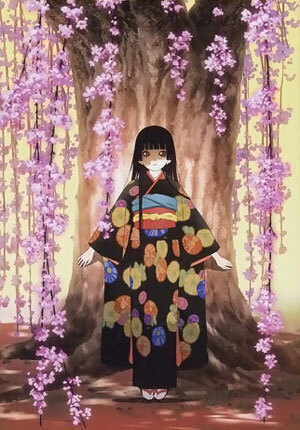 It is shown that Ai now resides inside Yuzuki, using her as a human vessel to carry out her duties as Hell Girl. When a person forms a contract with the Hell Correspondence, Yuzuki will become Ai to send the victim to Hell. Much like Tsugumi in the first season, she is able to see visions of those who have called upon Hell Girl; although it is often acquaintances of her own who do so, the actual number is uncertain. About halfway through the series, Ai releases herself from Yuzuki during The Six-script Lantern ceremony in her town in which the gate to hell is temporarily open. It is still implied that Yuzuki still has a connection to her. After her friend, Akie, is sent to Hell, Yuzuki's eyes were seen to flash red for a moment. It is unknown what meaning, if any, this signifies. Now, she tries to keep Ai's clients from sending their tormentor to Hell. Despite the fact that the cycle of hatred is a part of life, she never stops trying to end it. Even after being shown visions by Ai proving that there's no way to stop revenge, she continues to try. In episode 19 of Mitsuganae, Ai reveals to Yuzuki that she is destined to become her successor. Yuzuki also discovers that Ai's assistants are staff at her school. A television psychic named Gilles de L'Enfer, who calls himself Hell Boy. As child he possessed powers that frightened even his own parents to the point where they killed their own son. His powers gave him the ability to escape Hell. After he escaped Hell he sought revenge against his parents and sent them to Hell. He made his first appearance in season 1, challenging Ai to a duel. He gained the upper hand in the duel, overpowering both Ai and her three companions. Before he was able to defeat Ai and send her to Hell, he himself was sent to Hell by a man named Hiroshi Watanabe, who was holding a pact against him. While being ferried to Hell, he promised he would escape Hell once again. He is referenced at the end of episode 10 of Mitsuganae by a small group of school joggers as they cross the finish line. Gilles makes a brief cameo appearance in episode 21 of Mitsuganae, appearing as an egg shaped character stitched on a hat, which is owned by a young boy named Kaito. The character is wearing the exact same attire that Gilles wore in season one. The facial expression on the Hell Boy character symbol appears to change through out the episode, showing that Gilles may have been supernaturally manipulating this character on the hat and possibly Kaito. The character symbol grins during tense moments and the eyebrows become bold during moments involving the the straw doll, implying that Gilles feels sadistic pleasure from pain and suffering caused by the Hell Correspondence.